While research on the geography of personality, such as the 2008 study by Rentfrow and colleagues, published in Perspectives on Psychological Science and described in the previous post, provides an interesting insight into the distribution of psychological traits over the country, there are a number of problems with this sort of inquiry, some recognized by the authors and others not. Several of the flaws in Rentfrow et al.’s study are inherent to the Five Factor Model of personality that they use. First, the five factors—extraversion, agreeableness, conscientiousness, neuroticism, and openness to experience—are not fully orthogonal to one another. For instance, there appears to be a negative correlation between neuroticism and extroversion: those who are more prone to experiencing negative emotions tend to be more introverted. Certain behaviors, moreover, can be seen as manifestations of more than one of the five traits: for example, thinking before acting is linked by some psychologists to introversion and by others to conscientiousness. Second, the same traits can be given either negative or positive values: for instance, low level of openness to new ideas can be viewed as narrow-mindedness or as valuing tradition, while a high score on the neuroticism scale may be branded positively as “being in touch with one’s feelings”. Such differences in labeling the same trait may have a geographical dimension. According to Ted Ownby of the University of Mississippi, residents of this state, which ranks 4th on the neuroticism scale, “would be proud”, of such a ranking, as “in the home of William Faulkner, [they] take intense, almost perverse neuroticism as a sign of emotional depth”. Third, a number of psychologists have argued that the “Big Five” do not encompass all aspects of human personality, and have therefore suggested adding other traits to the list, especially those that are more privately held or more context-dependent and are therefore harder to observe in a stranger. Among such additional traits are honesty, attachment, need for achievement, manipulativeness, thriftiness, masculinity/femininity, sense of humor, sexiness/seductiveness, snobbishness/egotism, and risk-taking/thrill-seeking. As Rentfrow et al. 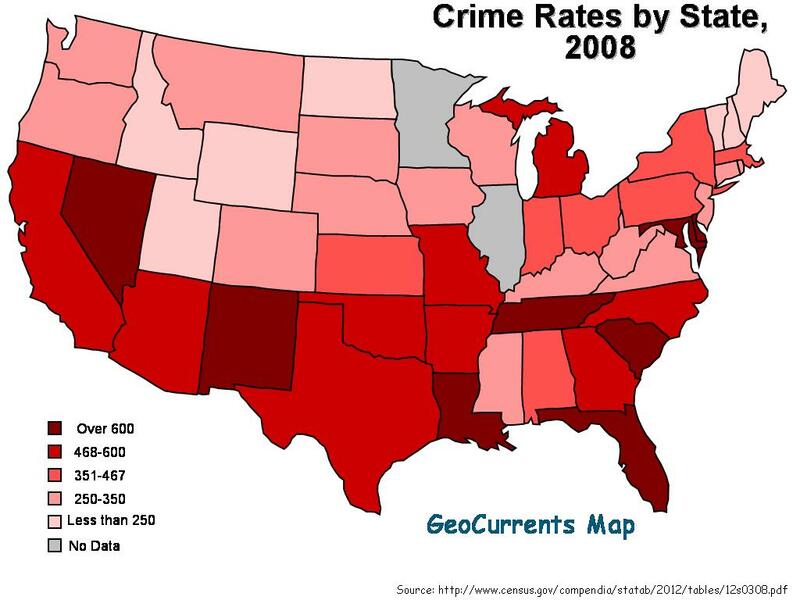 point out, “it is tempting to suppose that geographic variation in such variables would be linked to an assortment of important geographic social indicators, such as crime, social capital, marriage and divorce rates, and economic growth” (p. 364). 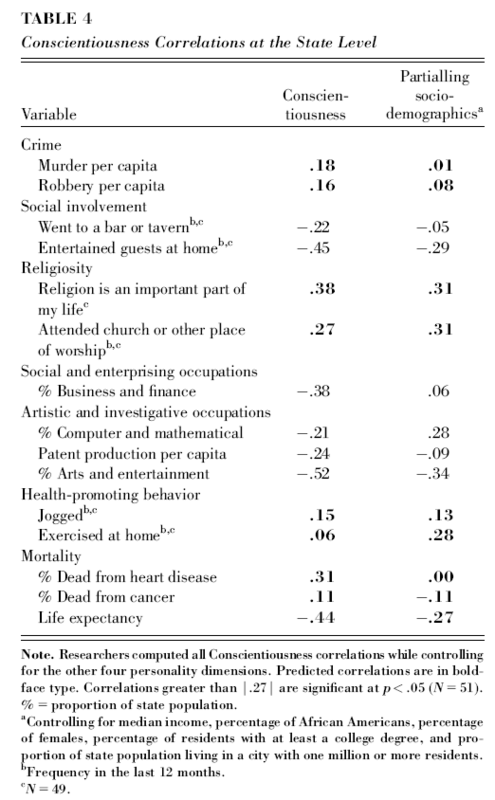 I, for one, would like to see whether sense of humor correlates with crime rates, or whether sexiness/seductiveness has any connection with economic growth. An additional issue is that the same trait may manifest itself differently, both at the individual and regional levels of analysis. For example, a dutiful person may apply his thoroughness and self-discipline in a number of distinct ways. 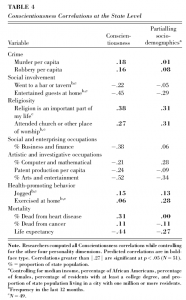 At the state level, this trait correlates almost equally strongly with both religiosity and with health-promoting behaviors (see the table reproduced on the left). Moreover, a comparison of the conscientiousness map and the church attendance map (see on the left) reveals that while some “dutiful” states, like Utah (which ranks 4th on conscientiousness scale), also have high rates of church attendance, others, like Colorado (which ranks 15th on conscientiousness scale), have some of the lowest church attendance rates in the nation. But Colorado has many outdoors and sports enthusiasts. 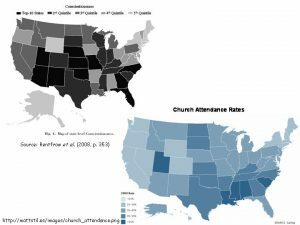 Thus, it appears that conscientiousness manifests itself through going to church in some states and through going to the gym in others, but Rentfrow’s study obscures that distinction. A much more significant problem is that the study provides psychological snapshots of states as a whole. As alluded to in the previous post, my impression of New Yorkers, based on residents of Ithaca, might have been quite different had I been more exposed to Manhattanites. Such averaging of upstate “apples” and uptown “oranges” may well bring an average resident of the state down on the agreeableness scale and up on the neuroticism scale as compared to what I would have imagined based on my personal experience. In a state as large and diverse as California, profound regional differences in personality formation would likely be encountered. Rentfrow et al. admit that “it would be useful to examine even narrower geographic levels of analysis” (p. 363). They refer to an earlier study of individualism and collectivism, conducted in Australia and Japan, which found that “participants from rural locales were higher in collectivism than were those living in metropolitan cities” (p. 363). 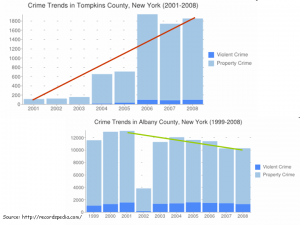 * Moreover, as pointed out by Wall Street Journal’s Stephanie Simon, “the assessments were linked to each respondent’s current residence, so there was no way to tell if a New Yorker was a New Yorker born and bred, or had just moved from Kansas… who may, after all, have been drawn to New York because the big-city bustle suited their personality”. At the moment, the causal directions of the relationships among biology, personality, and culture are not yet clear. Some scholars (e.g. McCrae 2001) attribute geographical differences to biology and suggest that culture is a reflection of biological and genetic differences, while others attribute the differences to culture and argue that national cultural differences cause individuals to develop different personalities (cf. Hofstede 2001; Triandis & Suh 2002). Rentfrow et al. suggest conducting time-lagged analyses using geographic personality estimates and social indicator data, such as those used in their 2008 study, but collected over several years. 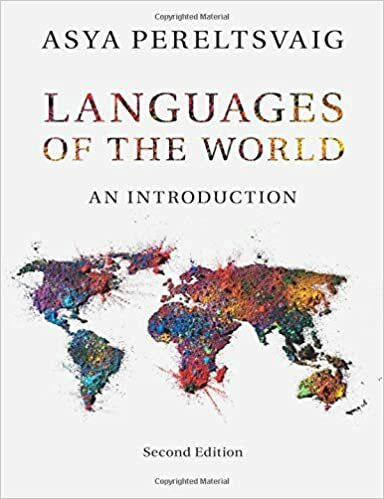 They hypothesize that “if region-level personality is a cause of differences in culture and geographic social indicators (e.g., crime rates, public opinion, morbidity), then changes in personality trait prevalence should lead to changes in the outcome variables” (p. 363). For example, if a high number of “open” individuals migrate to a state ranking low on the openness scale, such as Alabama or Wyoming (48th and 50th, respectively), “that change may lead to an increase in liberal public opinion and patent production and, thus, to a more open culture”. The causal relationship from region-level personality and differences in culture and geographic social indicators is well supported by research in several disciplines. Numerous personality studies clearly indicate that individual differences in personality are connected to a range of psychological and behavioral tendencies; work in macroeconomics, political science, sociology, and cultural psychology provides evidence that group behavior affects macrosocial variables such as crime rates or voting patterns. What is much less clear is whether “macrosocial variables precipitate regional differences in personality”; that is, whether “societal changes should lead to changes in personality trait prevalence” (p. 363). 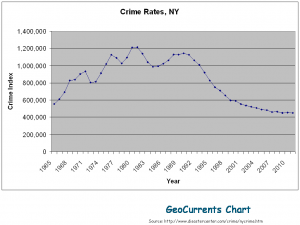 According to this hypothesis, a drop in crime rate in a given region would be expected to lead to an increase in agreeableness and a drop in neuroticism. While no controlled studies are available to confirm or disprove this idea, it appears that changes in personality cannot be brought about easily by changes in macrosocial variables. 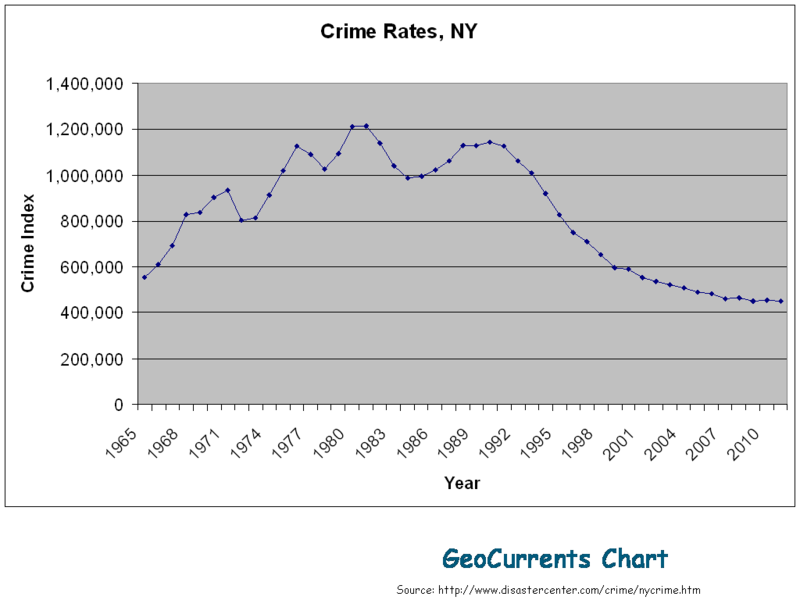 For example, New York state as a whole has experienced a significant drop in crime rates in the 1990s; by 2008 its crime index has dropped to nearly a third of that in 1990. 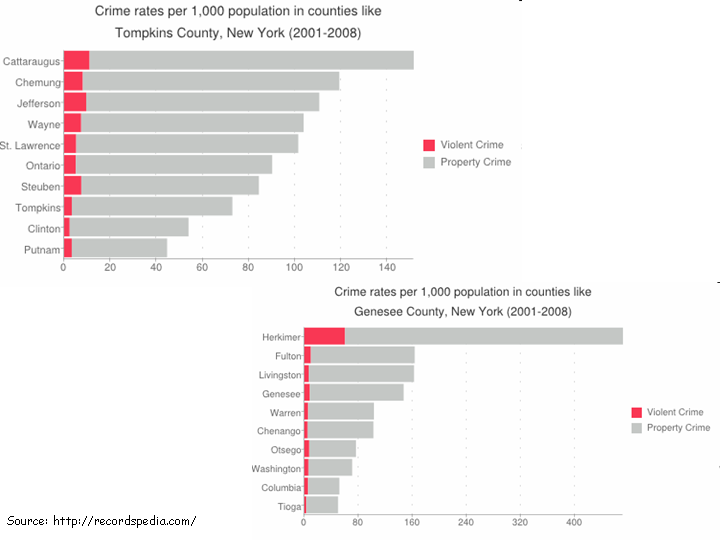 Incidentally, crime rate figures remind us of the dangers inherent in generalizing over states: when it comes to crime rate statistics, New York’s counties vary widely, even if we compare only rural counties. 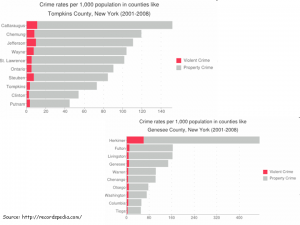 For example, the property crime rate in Tompkins County (where Ithaca is located) is only about half that of Cattaraugus County, also in upstate NY, while the same figure for Herkimer County exceeds that of Tioga County eight-fold. 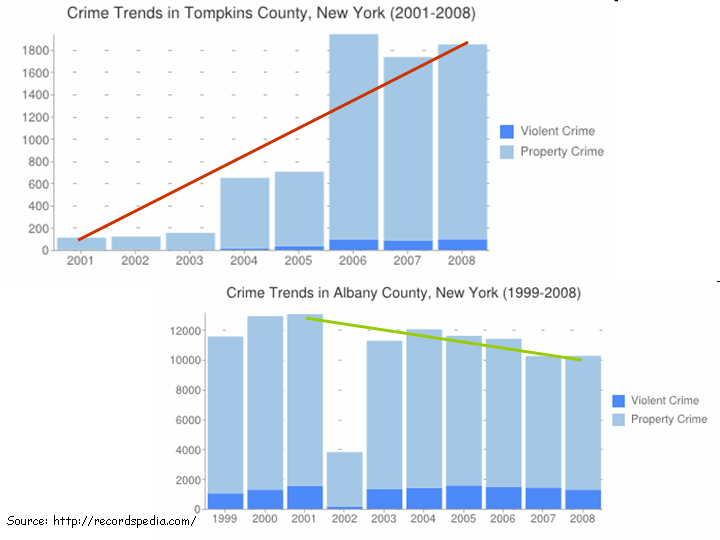 Similarly, counties differ in regard to their crime trends: for example, Tompkins County experienced a sharp increase in crime rates—both property and violent crime—in 2001-2008, whereas Albany County (home of the state’s capital, Albany) experienced a drop in crime over the same period. In other states, the situation is much the same. 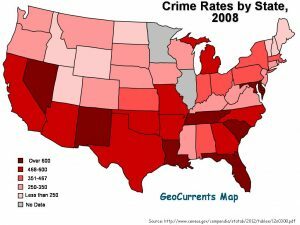 For example, in California property crime rate in San Joaquin County in 2007 was more than double that the more peaceful and prosperous San Mateo, Orange, and Ventura counties. Let’s go back to the issue of whether the prevalence of a certain personality trait in a given region or state may change in response to institutional or policy shifts and consequent transformations in macrosocial variables. In principle, there are two ways in which such changes in a state’s psychological profile may occur: either through established residents developing a certain trait in response to external social changes or through individuals already possessing that trait moving to the state because of such social changes. For example, a drop in the crime rate might cause old-time residents to develop warmer and less neurotic personalities, or it might attract warm and calm individuals from other areas. While both possibilities probably happen, personality changes in individuals are neither quick nor sharp, in large part because the Big Five traits have been shown to be affected by both nature and environment in roughly equal proportion. Depending on the trait, between 42% and 57% of observable differences between individuals is said to be due to genetic differences. While these heritability figures are derived mostly from twin studies, new light has been shed on the nature/nurture issue in regard to personality by genetic research. Studies such as Depue & Collins (1999) have linked extraversion to higher sensitivity of the mesolimbic dopamine system to potentially rewarding stimuli, which has in turned been shown to be genetically encoded. Individualism/collectivism too has been shown to have a genetic basis. 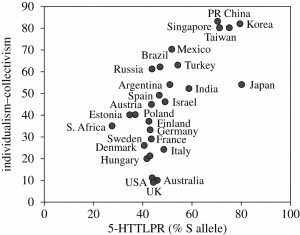 Having analyzed data from 30 countries, Chiao and Blizinsky (2010) found a strong correlation between collectivism and the presence of a certain genetic marker in the serotonin transporter gene (i.e. 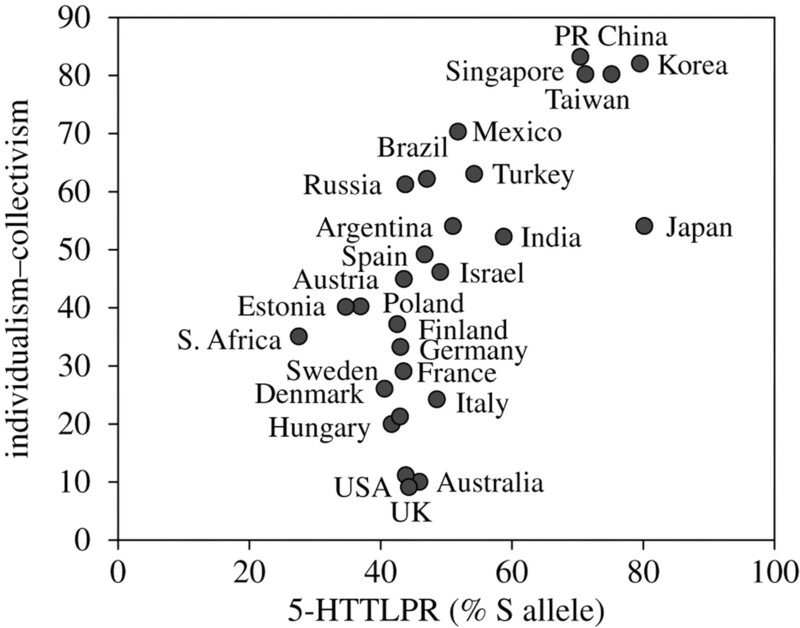 S allele of 5‑HTTLPR), which is known to put individuals at greater risk for depression when exposed to life stressors—in the absence of social support networks found in collectivist cultures. ** The figure, reproduced on the left from Chiao and Blizinsky (2009), illustrates the geographical coincidence between genes and culture across countries. The map (a) in the upper left shows world-wide variation in individualism-collectivism ranging from yellow (individualist) to red (collectivist). The map (b) in the upper right shows the frequency distribution of the relevant genetic marker. The map (c) in the bottom left depicts the global prevalence of anxiety, while the map (d) in the bottom right illustrates the global prevalence of mood disorders (yellow to red color bar indicates low to high prevalence). The idea is that that collectivist cultures protect individuals from the genetically predetermined risks by embedding them more strongly in communities with strong social links thus providing robust psychological support networks. Therefore, such a gene is more adaptive in collectivist cultures and may be selected against in individualist cultures. Another study, Way and Lieberman (2010), identified another marker in a gene involved in neurotransmitter regulation. They reasoned that this gene operates by making people more socially sensitive and thus more prone to depression in the absence of the strong social support available in collectivist cultures. A third personality-related genetic marker, also in a dopamine receptor gene, has been linked to non-conformity, novelty seeking, impulsivity, and attention deficit hyperactivity disorder. As a result of personality traits having a genetic basis, it is not easy to turn a born-introvert into an outgoing extravert, a collectivist into an individualist, an anxiety-ridden person into a happy and calm one, a perfectionist into a careless and easy-going individual, or vice versa. But what of the possibility that people migrate to areas that suit their personality? Hard data is not available but it is possible that such process occurs, even if on a subconscious level. For example, there is ample evidence that some people decide to move to areas that tend to vote along the same lines. Since voting patterns have been shown to be linked to psychological traits, it is natural to assume that people also sort themselves by personality—even if indirectly so. *Japanese participants on average turned out to be higher in collectivism than those from Australia. **Another study by Stoltenberg et al. (2002) related the 5-HTTLPR polymorphism associated with the serotonin transporter gene to openness to experience, whereas an earlier study by Lesch et al. (1996) found some connection between this polymorphism and neuroticism. Such multiple connections between a given genetic marker and a number of different personality traits further highlight the point that the Big Five Factors may not be fully orthogonal. Chiao, Joan Y. and Katherine D. Blizinsky (2010) Culture–gene coevolution of individualism–collectivism and the serotonin transporter gene. Proceedings of Biological Sciences 277(1681): 529–537. Depue, R. A., & Collins, P. F. (1999). Neurobiology of the structure of personality: Dopamine, facilitation of incentive motivation, and extraversion. Behavioral and Brain Sciences 22: 491–517. Hofstede, G. (2001) Culture’s consequences: Comparing values, behaviors, institutions, and organizations across nations (2nd ed.). Thousand Oaks, CA: Sage. Lesch, Klaus-Peter; D. Bengel; A. Heils; S. Z. Sabol; B. D. Greenberg; S. Petri; J. Benjamin; C. R. Muller; D. H. Hamer; and Dennis L. Murphy (1996) Association of anxiety-related traits with a polymorphism in the serotonin transporter gene regulatory region. Science 274 (5292): 1527–1521. McCrae, R.R. (2001) Trait psychology and culture: Exploring intercultural comparisons. Journal of Personality 69: 819–846. Stoltenberg, Scott F.; Geoffrey R. Twitchell; Gregory L. Hanna; Edwin H. Cook; Hiram E. Fitzgerald; Robert A. Zucker; Karley Y. Little (2002) Serotonin transporter promoter polymorphism, peripheral indexes of serotonin function, and personality measures in families with alcoholism. American Journal of Medical Genetics 114 (2): 230–234. Triandis, H.C., & Suh, E.M. (2002) Cultural influences on personality. Annual Review of Psychology 53: 133–160. 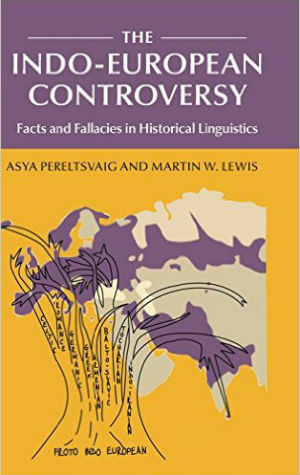 Way, Baldwin M. and Matthew D. Lieberman (2010) Is there a genetic contribution to cultural differences? Collectivism, individualism and genetic markers of social sensitivity. Social Cognitive and Affective Neuroscience 5(2-3): 203-211.